Deus Brut des Flandres (2010) 24/24 - The end of the 2012 Advent Calendar! Day 24! Well the advent calendar comes to an end! 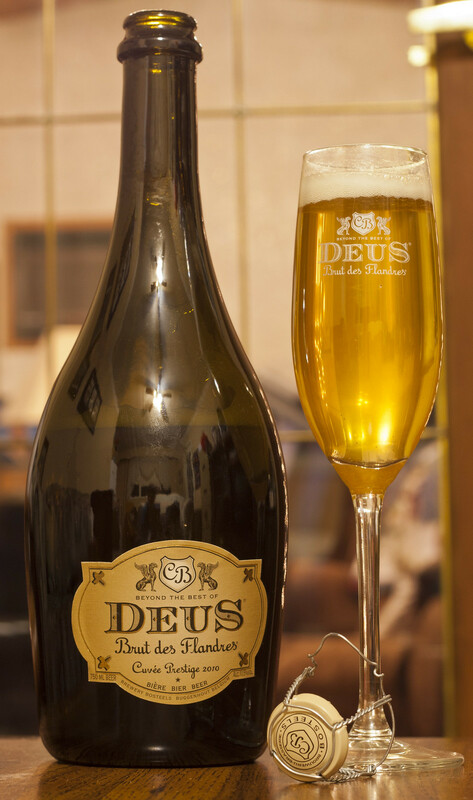 Tonight's beer is the excellent champagney beer DeuS Brut des Flandres Curvée Prestige (2010) by Brasserie Bosteels. This is my go-to champagne alternative every Christmas season since 2010. The beer combines a great Belgian pale ale-like beer and a French champagne, bubbly, sweet yet beery. Appearance: Incredibly foamy and carbonated, as I pop the cork, it makes a really loud POP! The carbonated foam goes down quickly. It's a slightly hazy golden straw, champagney. Aroma: Hoppier than I remember, I notice a bit of a soapiness to the aroma, as well as a sweet Belgian ale yeast. Taste: A sweet and florally hoppy beer. Notes of champagne, herbs, bit carbonated on the mouthfeel, quite mellow yet quite sweet, a light lemon citrus. Overall Thoughts: More of a Belgian pale than a champagne ale this time around, but the previous batch was of 2009 edition, rather than 2010 this time. I enjoyed it again, but I'm in a bitchy mood so I'm not going to really take the time to really go through it. But hey, if you see it.. buy it. It's $19, a bit pricey but if you are looking for an alternative to a New Years champagne, this is a great beer! It also has 11.5% ABV so you will get a buzz if you drink it all yourself.. like I am. Merry Christmas!